I’ve been living high on the hog lately. On my second visit to El Take it Easy to play Bacon Bingo, I literally brought home the bacon. And I won on the the first game of the night, too! Few things beat screaming ‘BACON’ at the top of your lungs when you realize you have four numbers in a row before anyone else in the restaurant. That winning streak was followed by fellow blogger, Leeanne from Three Dog Kitchen winning her own 1 lb. package of bacon. Unfortunately, the games after that didn’t result in the rest of our party winning their own. With this bacon, I wanted to do something special. Not the run-of-the-mill eggs with bacon or BLT sandwich but something requires some assembly and preparation. The answer? 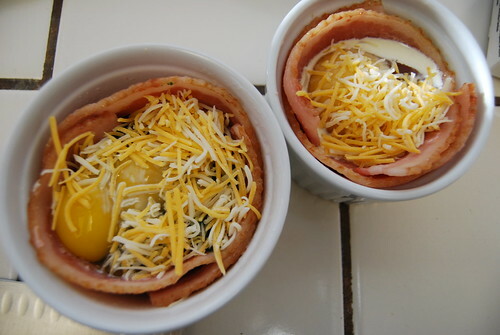 Baked eggs in bacon cup. This dish can easily be prepared in a muffin tin but my baking ware of choice is a ramekin. 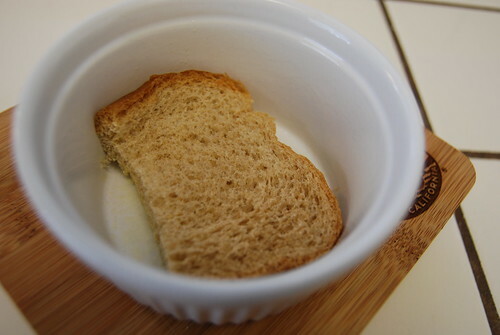 A slice of bread split in half is placed at the bottom of a ramekin. Cook bacon until barely crisp yet still flexible so it can form around the inside edge of the ramekin. Add eggs and spinach with a bit of heavy cream and top with cheese. Bake until the egg white is still a bit jiggly. You can substitute sliced tomatoes for spinach if you like. 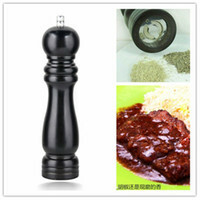 Or completely remove any vegetables. As for the bacon, you’ll have buy your own. Unplanned double yolks! And a ramekin without spinach. Read about the night’s festivities from Mary, Marie and Leeanne. Spray the bottom of two ramekins with nonstick spray. Split bread in half and place at the bottom of ramekins. Heat frying pan over medium heat and cook bacon until barely crisp on both sides but still pliable. Transfer bacon to paper towels to drain. 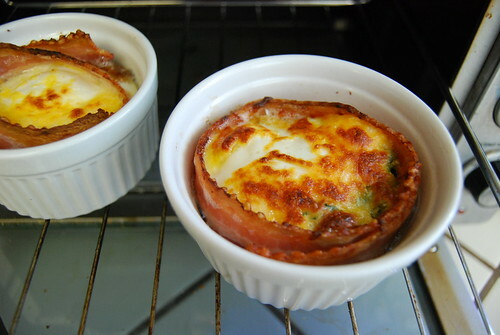 Line sides of both ramekins with two slices of bacon each. (Skip this step if not using spinach.) Using same pan, heat frozen spinach until heated through. 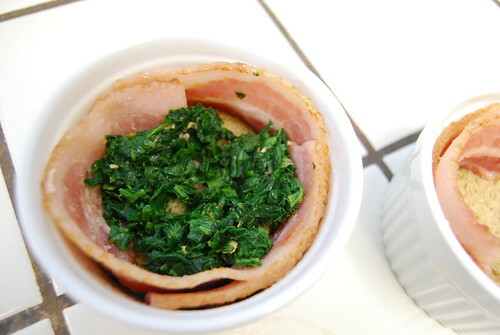 Divide spinach between two ramekins. 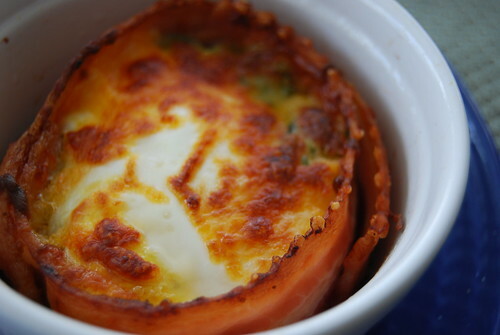 Crack open an egg into the center of each ramekin. Add a teaspoon of cream to each portion and sprinkle with shredded cheese. Transfer cups to preheated oven and bake until egg white is almost set; about 10-15 minutes. For firmer eggs, add extra 5-10 minutes. That looks so good! A very nice use for bingo bacon. I didn’t do anything special with our bacon, but we certainly enjoyed it! Did you find the smell of the bacon INTENSE? I did with an especially super smoky smell. hi darlene – cool recipe! 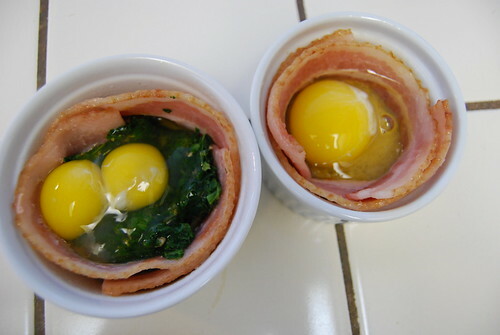 i like how the bacon lines the ramekin. so, the egg had 2 yolks in it? ooh, MUTANT TWINS. i have some bacon waiting to be made into crumbles for my corn chowder. I’ve never had corn chowder. I hope you post a recipe. i haven’t posted it yet but here’s the recipe, taken from an older issue of real simple. i’m lazy like that. it’s kinda like the one your friend justjenn posted but with bacon, smoked paprika, crushed red pepper, green onion garnish and no potatoes. Yum! Bacon! I had a bacon fest last night. Added bacon to our salads and to some grilled cheese sandwiches. Everything was just a vessel for eating bacon. Bacon and spinach is my favorite combo! What an excellent breakfast option.